These past few weeks have really seemed to shake up the Standard player base, with the upcoming Pro Tour and a surprisingly large number of playables in Magic 2015 that seem to be everyone’s main focus. I am not usually one to follow the pack, but given my attempt at some new formats, I figured analyzing what little we now know about the potential metagame may tie in very well with what we should be looking to pick up in the upcoming weeks. Prices have finally settled some on M15, so now is the time to look at some of these cards that may have settled just a little too much. I want to start by looking at some of the decks we saw last weekend in Baltimore. This is where I am focusing most of my attention, as we have very little else in the way of results yet. That may change some leading up to the Pro Tour, but if you want to gain an early lead before people pick up on the gems, now is the time. Waiting for more results can usually solidify what you want to acquire, and I—as well as you—should continue to watch results. On the flipside of that argument is that the moment the public figures out what is likely to spike, your chances of getting stores to send them in any real quantity is low. Trading for them becomes more difficult as well, as more people are suddenly looking for them, and that means, even if your call was spot-on, you may have very little to show for your efforts. The logical place to begin when looking for the new pick-ups is right at the top, and in this case, that top spot was taken by the boogey man: Mono-Black Devotion. Nothing here looks out of the ordinary. Perhaps people are still in that usual first-week slump in which they do not have much time to test and therefore play a comfort deck with a few minor changes. Outside of a lonely Urborg, Tomb of Yawgmoth, there is not much to see here, so let’s move on and see if anyone got those creative juices flowing. Now this deck is slightly more interesting. I am a huge fan of seeing Loxodon Smiter and Voice of Resurgence again before they show themselves out in the fall. Soldier of the Pantheon also seems to be a card to keep an eye on still. Though this will be rotating out, that does not mean there will not be enough pieces to see G/W through to the fall. Another important note is the reliance on Mana Confluence that a number of these three-colored decks have. I have seen more and more of these coming in as the alternative to the pain land cycle in M15. The rest of the Top 8 seemed relatively quite as far as innovation goes, and whether that comes from inexperience with a new deck or holding lists until after the Pro Tour, that gives us little go on. One other piece of information I gleaned from poring over these results is that Hero's Downfall seems to be even more of a player going forward than I expected. The number of decks able to play black right now is higher than it was before, and with Mono-Black Devotion still showing it can hold in there, I expect to see that card climbing soon. I don’t have too many other tested decks yet to draw from, but from looking around at what the pros seem to be brewing and from talking to a friend who is headed to Portland, I expect a few archetypes to certainly make an appearance. Mono-Green Devotion is among the new exciting additions to the metagame with new cards—such as Nissa, Worldwaker and Genesis Hydra—finally pushing another devotion deck over the edge. I do not have a particular list to draw on, but the shells seem relatively focused on the same concept, with Nykthos, Shrine to Nyx breaking matchups wide open in the late game. Nykthos is a card I have been watching for a while, as it has slowly dropped down below $5. I think now is an ideal time to jump in on these if you can find them in binders. $5 apiece in cash is usually a little higher than I am looking to spend, but if devotion continues this trend, I may be looking back in two months wishing I had. Devotion will certainly take a hit after rotation, as each color loses a few key pieces, but I expect at least Mono-Black Devotion—and now Mono-Green Devotion—to hold through rotation. This means Nykthos will already have two decks it will see play in, and that is usually enough to keep a price high on its own. On top of that, this card certainly has Eternal implications down the road, and I would not be surprised if $5 is the lowest we ever see it at again. I don’t usually lump decks together if they play differently, but I have seen so many control lists coming out these past few weeks, and I don’t know where the metagame will end up on that archetype. The real key factor I have been watching for is how many of these new brews are playing three to four copies of the same cards, and though the color combinations are all over the place, there are still some patterns. The first thing I noticed, as I mentioned earlier, is the sheer number of copies of Hero's Downfall I have been seeing in lists. This card has already gained a little steam over the past week, and I do not expect that to let up. As odd as this one seems, I think it may be an all right time to pick up Desecration Demons. I expect a number of people to be looking at decks that are not as impacted by the rotation, and with Mono-Black Devotion already being a frontrunner, that seems to be a likely choice. This means people will still have to pick up the cards that are rotating, and this is my choice for the best possible value, both in the short and long term. In the short term, this card is only a $1.50 right now, and considering the number of both control and midrange decks, that seems very low, even for a card headed out. The plus side of this card—and what makes it my choice over other cards—is that it sees play in a number of decks rather than just in one, and it also has a chance to see some Eternal play down the road. I do not believe rotation will drive this card much lower than it already is, and that means, all around, even for a card that has a short life span, it may be correct to pick some up now. 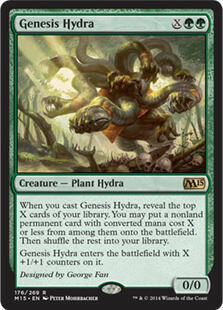 My last card for today has to be Genesis Hydra. There is almost no downside to this card at $3 right now. First of all, this card is probably far more playable than most people give it credit for, and it also has the major casual appeal that comes along with most Hydras. I have seen a ton of new brews with this, and not only in Mono-Green Devotion, but also in a number of midrange and Chord of Calling lists. This, in combination with Chord, allows you so much deck versatility and allows you to run fewer copies of other cards while ensuring you always have them. I expect this to be $5 sometime soon, and I hope it will ride out most of its life in Standard there. All of this recent digging has really gotten me back into the rhythm of playing again, and I am extremely excited to not only watch my friends compete, but also to see what decks make it out of the gauntlet. With the Pro Tour but a few weeks away, be sure to acquire what you believe you will need before the price spike that usually follows the event. As always, please leave any comments or questions below, and let me know if there are any particular cards you believe are currently flying under the radar. I have seen so many lists at this point, and I am sure I am missing a few. Thank you as always for reading, and keep sending me that feedback!